This topic contains 3 replies, has 2 voices, and was last updated by Andy 4 months, 3 weeks ago. On the single product page of https://www.bosbeauty.nl and https://mekpaardensport.nl are the images very blurry. In the old themes they where nice and sharp. Also the size change doesn’t work, i can change the size in the customizer but the front end size is still the same. How can i change it, and make the images nice again? In our demo site we have set the product image for the single product page to 900px wide, and the original full size images are all at least 900px wide so there will be no blurring. See screenshot below. On your sites, what width have you set the ‘Main image width’ to be? 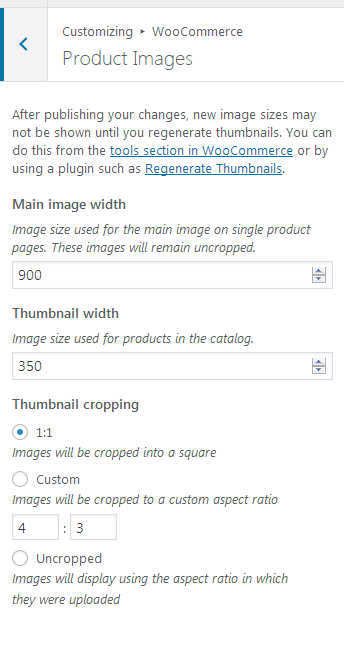 And are all your uploaded full-size product images at least as wide as this setting? No the images are smaller (got them from the supplier), That will explain the blurry images. I want to have the max width on 400 i think, The customer can click on it to see the bigger version. That version is okay by the way. If you are limited in the width of your images, there are a couple of settings that will help. The first is the page container width which is set to 1920px by default. Change this at ‘Customize’ > ‘Layout Options’ > ‘Container Width’. The second option is the width of the single product image gallery width. This is set to be 50% of the page container by default. You can try changing this to something like 20% or 30%. 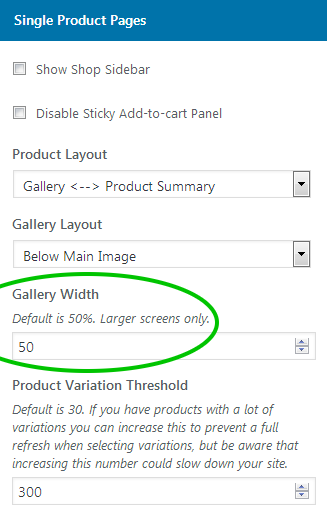 This can be changed at ‘Customize’ > ‘Shop Options’ > ‘Single Product Pages’ > ‘Gallery Width’. See screenshot below.